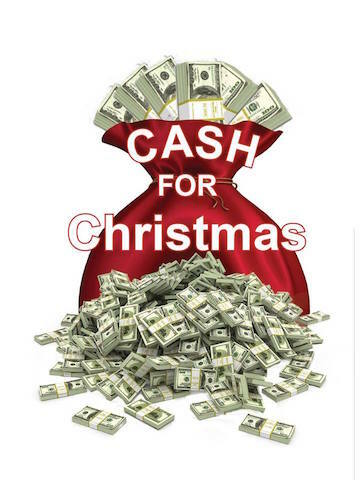 The Atchison Area Chamber of Commerce and its member businesses present Cash For Christmas, a program aimed at attracting new customers to Atchison, as well as rewarding those who choose to shop local during the important holiday season. Contest will begin on Black Friday, November 23rd and conclude Saturday, December 15th. Customers will take receipts to the Chamber to receive their tickets. Receipts dated November 23rd - December 15th from participating businesses will be given one ticket for each $10 Spent. Deadline to redeem receipts at the Chamber is close of business (5:00pm) on Wednesday, December 19th. Chamber will be redeeming receipts for tickets Monday-Friday from 8:00am to 5:00pm from November 23rd through December 19th. Receipts can be redeemed individually or brought in all together at one time. Out of town/weekend shoppers will be able to redeem their receipts and get their tickets at Gateway to Kansas Shops (504 Commercial). The winning number(s) will be announced on KAIR Radio (93.7 FM) on Friday, December 21st and will be posted on the Atchison, Kansas Facebook page (www.facebook.com/visitatchison). 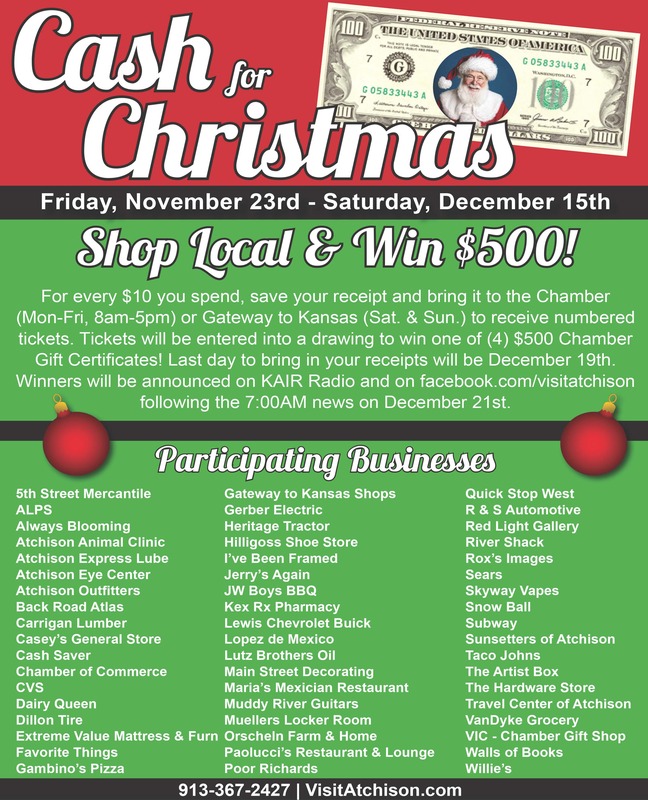 Tune in to KAIR Radio (93.7 FM) on Friday, Dec. 21st to hear the winning numbers announced, or log on to the Atchison, Kansas Facebook page (www.facebook.com/visitatchison). Call KAIR at 913-367-9370 to notify us of your winning ticket. You have 1 hour to make that call. From there we will give you instructions on how to present that winning ticket, based on your proximity to Atchison. You must return the winning ticket.